Four new species of genus Pallisentis (Van Cleave, in Records Indian Mus 30:147–149, 1928) are described from the state of Uttar Pradesh, India, infecting freshwater fish. The detailed morphology of all four species was studied using light and scanning electron microscopy. They are: Pallisentis lucknowensis n. sp. from Channa punctatus (Bloch 1785); Pallisentis amini n. sp. from Channa striatus (Bloch 1785); Pallisentis meyeri n. sp. from Channa punctatus (Bloch 1785); and Pallisentis unnaoensis n. sp. from Glossogobius giuris (Hamilton 1822). All four Pallisentis spp. differed from other congeners because of the morphology of the proboscis hooks, size and shape of proboscis hooks, shapes, number and arrangement of trunk spine, size of cement gland, numbers of cement gland nuclei, lemnisci, size and position of testes, gonopore, etc. An updated key of genus Pallisentis of 33 species accepted as valid are provided. 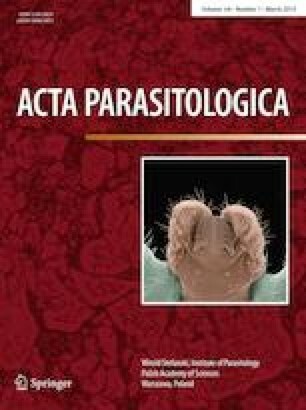 The present study extends the number of Pallisentis from 29 to 33 species. We thank the University Grants Commission, New Delhi for the financial assistance through a Rajeev Gandhi National Fellowship (F1-17.1/2013-14/RGNF-2013-14-SC-UTT-43684/(SAIII/Website). We also thank USIC, Babasaheb Bhimrao Ambedkar University, Lucknow for providing SEM facility.